The sky from mid-northern latitudes at 6:30 p.m. local time on Nov. 25. In our current evening sky we have one of the earliest soap-operalike stories, with two independent plots becoming intertwined into one. We met two of the characters last week: Cassiopeia and Cepheus, the Queen and King of Ethiopia, who appear to ride upside-down high above the North Star (Polaris) during the early evening hours. It was Cassiopeia who had boasted that she was far more beautiful than the Nereides (sea nymphs). As a punishment for her boastfulness, Neptune flooded the seacoast and sent Cetus, a vicious sea creature to ravage the land. To save Ethiopia, Cepheus followed the advice of the oracle of Ammon in Libya and chained his daughter, the princess Andromeda on the rocky shore as a sacrifice. As Cetus approached, however, the hero of the story, Perseus, suddenly appeared (almost like the charging cavalry in an old western) on his winged horse, Pegasus. Perseus was returning from a mission to slay the Gorgon Medusa, who had snakes for hair and whose hideous gaze turned the viewer to stone. Perseus removed her severed head from his pouch and held it front of Cetus, petrifying him. So Andromeda was saved and became betrothed to Perseus. 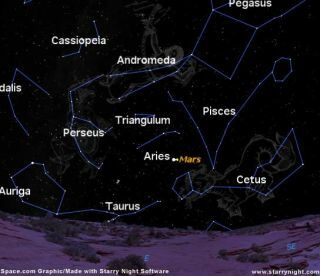 Nearly overhead at around 10:30 p.m. local time, is where we can find Perseus this week. To some it resembles an inverted fleur-de-lis (a stylized three-petaled iris flower, used in France as an armorial emblem). One branch curves toward the bright star Capella, the center points to the Pleiades, and the third ends in two stars, one of which is Algol, the so-called "Demon Star." Our word "ghoul" comes from the same Arabic word. Some believe Algol is so called because it seems to "wink" every 68 hours 48 minutes and 56 seconds. Thus, its name seems to suggest that the medieval Arabs were aware of its marked changes in brightness. In 1782, amateur astronomer John Goodricke (1764-1786) realized that this star was really a pair of stars orbiting a common center of gravity and that when the dimmer of the two crossed in front of the other, the light from Algol appeared to fade. Because the entire eclipse takes 9 hours and 40 minutes from start to finish, the entire performance can be seen in a single night when the timing is right. On the night of November 26-27, observers across much of North America and throughout Europe will be in perfect position to watch Algol undergo its eclipse. Most of the time Algol's light appears constant, but for about four hours its light varies noticeably. At its minimum brightness Algol appears only about one-third as bright as normal. Algol will be at minimum at 1:25 GMT on November 27. At that hour, for Europeans, Perseus will have moved to a position high in the west-northwest. That time corresponds to 8:25 p.m. EST on the previous evening of November 26 or 5:25 p.m. PST. So Americans must look toward the northeast to catch this stellar eclipse as Perseus gradually ascends the evening sky. Two hours before the predicted minimum start checking Algol's brightness. It is at minimum light for about 20 minutes - as the large, dim star passes across the smaller, brighter one - then it gradually returns to normal. Unfortunately, those in the western U.S. and Canada will not be able to watch Algol's light diminish, since the twilight sky will not become fully dark until around the time of minimum brightness. But its gradual return to full brilliance should readily be seen. If it's cloudy that night, there will be several opportunities to see Algol undergo an eclipse during December. It will be at minimum light on December 14 at 1:20 a.m. EST (10:20 p.m. on December 13 for the Pacific time zone) and on December 16 at 10:09 p.m. EST/7:09 p.m. PST.